It’s often said by “experts” in the field of nutrition that there are no “bad” foods, but I do have to wonder about Chicken Fried Steak – it just tastes so darned good! A huge fave of Child Number Two, Kraid, who has to have it when his birthday rolls around. I pull out the cast iron and go to town. Or maybe to country? That’s right! My son doesn’t want a steak dinner, he doesn’t want lobster, and he usually doesn’t even want to go out. He’d rather have an old down-home favorite, like this Chicken Fried Steak. With Mashed Potatoes, of course. And usually corn or fresh garden beans. And he’d rather have French Silk Pie than cake. If that’s not a classic meal, I don’t know what is. You might as well be sitting smack dab in the Midwest. I grew up in Northwest Iowa and I always just knew how to cook Chicken Fried Steak. No recipe needed. I guess that’s what happens when you hang out in people’s kitchens and ask questions. So when I saw a recipe for Chicken Fried Steak from Cook’s Illustrated I held back a snort and read it. See, I’m always wondering if can pick up something new and always still curious about food. And so on a whim, I tried The Cook’s Illustrated Chicken Fried Steak. And I was immediately hooked on the buttermilk, soda and baking powder crust & the bit of onion in the gravy. There were a few weird little things in the recipe that I just ignored. For instance, there was thyme in the recipe. I tried it once and put it in the recipe as optional, but no one here cared much for it in the gravy. Thyme became really popular back around the turn of the century (the 1990s) and was appearing in all kinds of recipes. 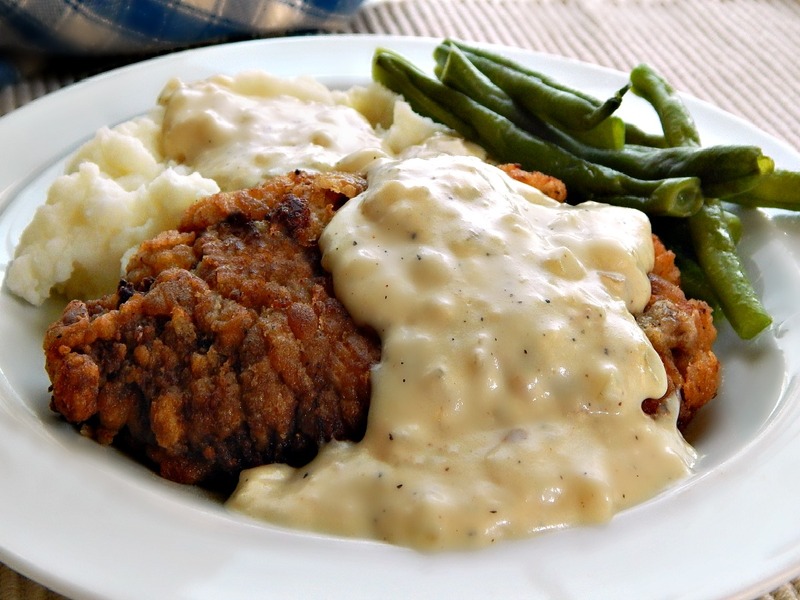 Chicken Fried Steak with Country Gravy is such a classic and should taste like Chicken Fried Steak with Country Gravy. not thyme. Amirite? Usually, Chicken Fried Steak with Country Gravy is made with cube steak. That’s my preference, but it’s not always available at the grocery. If it isn’t you can ask the butcher to run round steak through the tenderizer. Your other option is to use round steak and pound it just like you would for Swiss Steak, Rouladen or Pork Tenderloin Sandwiches. I detailed all the steps out on my post for German Beef Rouladen. Use a meat mallet or the side of a heavy plate. Sprinkle the steak heavily with flour and pound and pound, turn and sprinkle and pound some more. And when you think you’ve pounded enough, pound a little more. When breading, shake off the excess flour, then dip in the egg mixture and let it drip off before you place it back in the flour. Trying to build up your crust through heavy breading isn’t going to work and might make the crust bubble up, steam rather than being perfectly “crusty” and flake off in places, leaving bald spots. You just want a nice coating. Trust the process. Sometimes people try to skimp on the oil trying to save a few calories. The steak is going to absorb what the steak needs to absorb no matter how much or little oil there is and you really do need enough in your pan. Once the steak is in the oil should be al least halfway up the steak, not over. It’s pan-fried, not dee fried. If you don’t have a thermometer, sprinkle a couple of drops of water in the oil. It should dance vigorously. The last hint I have for the most beautiful Chicken Fried Steak with Country Gravy: Never place it on paper toweling. That’s going to steam your beautiful crust. Put it on a rack, and if you don’t have a rack, just carefully place it right on the oven rack. This really is a reasonably priced meal, depending of course on how much the cube steaks are. Watch for them on sale at the store and chuck them in the freezer until you’re ready to cook this. Or pick up the round steak on sale. There’s never a cost to having the butcher run it through the tenderizer. One thing I did snort at in the Cook’s Illustrated article: They suggested serving Chicken Fried Steak with Country Gravy with noodles. Uh-hunh, the sacrilege! Always serve this with Mashed Potatoes. Promise me! If you’d like to go a little fancier with the sides than corn or beans, maybe think about Corn Pudding. Biscuits could never be wrong, either, or a simple salad. All the sides for Chicken Fried Steak with Country Gravy are budget priced, too. It would just be wrong to serve it with anything fancy. So there you have it, a classic meal at a reasonable price! From my home to yours, wherever you are. Enjoy! You can work out tomorrow! In one shallow dish, place flour, cayenne, pepper, and salt, and mix. In a second shallow dish, place egg, baking powder, baking soda, and buttermilk. (The mixture will foam.) Set a wire rack over a baking sheet. Preheat oven to 200 degrees. Set a paper sack on a large baking sheet. Heat oil to 375 degrees in your cast iron skillet as you bread the steaks. Working with one steak at a time, gently pat steaks dry. Dip first in flour mixture and gently shake off any excess, then in the buttermilk mixture, letting excess drip off, then back into the flour mixture. Place steaks on rack. Reserve the seasoned flour, discard the excess buttermilk. When finished, gently place steaks in the hot oil. Fry on the first side for about 5 minutes. Carefully turn when a deep golden brown and juices from the steak begin to appear on the top side. Continue to cook for another four to five minutes until the second side is a deep golden brown. Work in batches if necessary. When the steaks are desired doneness, remove from pan and place on a baking sheet lined with a paper sack and place in oven to keep warm. Strain the oil from the pan, reserving the browned bits & oil. Return 3 tablespoons oil to the pan along with the browned bits, and make the gravy, below. Over medium-high heat, cook onion with thyme (if using) until onion has softened and just beginning to brown, about 4 minutes or so, stirring often. Add flour, stirring and cook for a minute. Add stock, stirring, then milk, slowly, and rest of ingredients. Stir until bubbly and thickened. This gravy will appear a bit loose, but thickens up once off heat. If you use the seasoned flour, you may not need additional salt. A proper country gravy like this should have a pourable, but still thick consistency. Any leftovers may need to be thinned with water or milk. This entry was posted in Click here for Bargain Meals, Click here for Fabulous Food Posts and tagged Beef, Cook's Illustrated, Country Gravy, cube steaks, Family Recipe, Round Steak, White sauce. Bookmark the permalink. There is also an appliance which is called “Fast Cutlet Maker V2” that pounds the meat lobes and after it have clear cube pattern on it. It is very popular in Germany. I have seen things like that on tv but had no idea you could get something for home. That would be great for country fries steak, pork tenderloin, swiss steak and all kinds of things! 🙂 Thanks!! Thanks for including the Chicken Fried Steak in your MARVELOUS round=up of Cast Iron Recipes! This looks so good, total comfort food! It just screams comfort food, doesn’t it? When I made this, I think I was still in denial fall was coming this way – we’ve since had a huge cold spell, and already I’m thinking about stews and pies and baking! Growing up in Texas where chicken fried steak is a tradition, I can vouch for how good it is. Hi Karen – It just really is, isn’t it! And made at home or at a Mom & Pop diner, it’s so different from the chicken fried steak that comes frozen and is served in some of the chain places. I guess anywhere beef cattle are raised (Iowa used to be pretty famous for their beef) you’d be likely to find this dish. It’s really a great way to use up the tougher parts. If one were slaughtering a beef, every part would be used. It’s not like a farmer or rancher would pick and choose what part they’d buy like we do today! I’ve only been through the great state of Texas once, and regretted I only had time for one meal! I chose barbecue…but there are so many great dishes that come from Texas, I felt I was really missing out! If you’re checking back, I’d love to hear what your absolutely best, favorite comfort food is! When I think of Texas, of course I think of big steaks, puffy tacos, tex-mex, chili, fajitas, and tamales! I love them! Barbecue, beef ribs and German Chocolate cake. But what does a Texan think of as her favorite? I bet he’s going to love it! Love chicken fried steak or chicken fried chicken for that matter. The white gravy and mashed potatoes wonderful. This is my idea of comfort food, add some succotash and it rounds it out. YUM! Oh my gosh -succotash – I haven’t thought about it for years! It was my favorite as a child and I STILL love lima beans! It’s the perfect side for chicken fried steak! I think we were on a rotation when I was a child in the 60’s, and a lot of it frozen, except when we had a garden: succotash, frozen green beans, peas, beans, corn, lima beans, the mixture my mom called Veg-All, which was corn, carrots, peas I think, and when it was a fancy dinner, peas and pearl onions in white sauce. Oh me too they are so good!